I must admit…there are days that I just do not want to cook in the summer. Shocking? Probably not. We all have those days when mustering the energy and creativity to fix dinner is simply not there. We could go out to eat, but it’s so hot out there. We could eat popcorn or cereal (trust me, this happens at least once a month here), but that isn’t a meal. We could order in, but we are tired of pizza. A refrigerator full of food and no inspiration to cook it can be disappointing. It is in these times that I draw upon my experience living in the high desert of southern California. During the 118 degree summers there, it was rare for me to turn on the cooktop. Adding heat to the environment just seemed very wrong. I mean, it was 118! So, what to do? I created a term that I lovingly call the “appetizer dinner.” What is this appetizer dinner, you say? It can be anything, really. It doesn’t have to be just appetizers, but the main idea is that I put things together that don’t have to be cooked to be enjoyed. 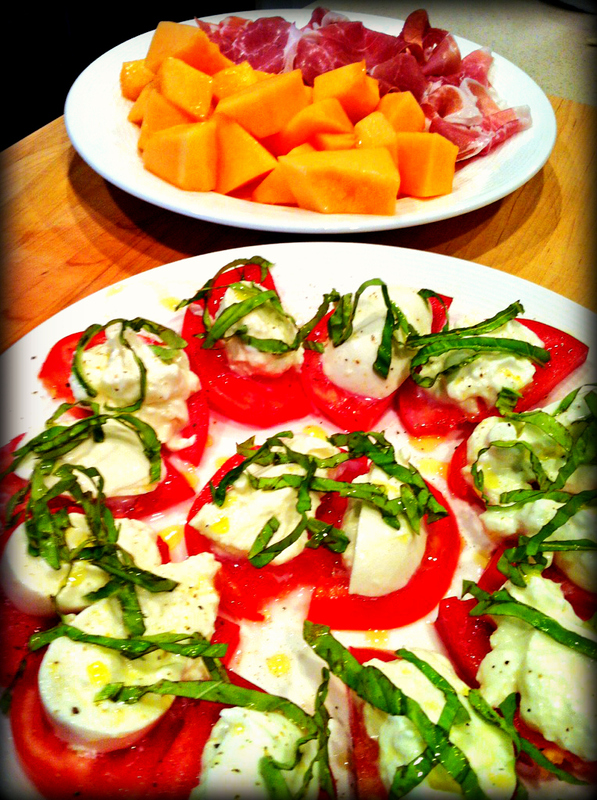 I like the simplicity that comes with things like a Caprese salad or goat cheese and crackers or a platter of prosciutto and melon. Serve these delicious plates together, and presto–you have a delicious dinner. No cooking involved! I like to be creative. Adding some fig preserves to the goat cheese and crackers is my favorite. Mix ricotta, lemon peel, salt, pepper, and a little thyme together for a lovely spread. 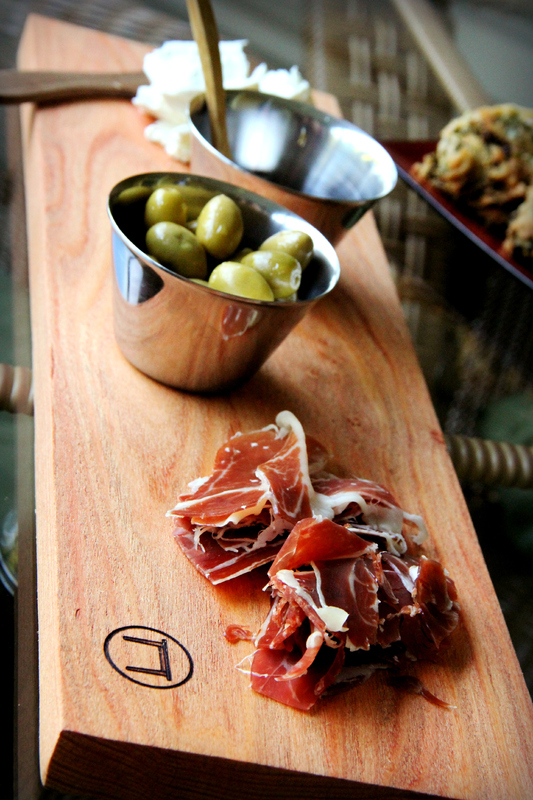 Olives or pickles make a nice accompaniment to any meat or cheese platter. I confess that I do occasionally add something cooked to this spread. 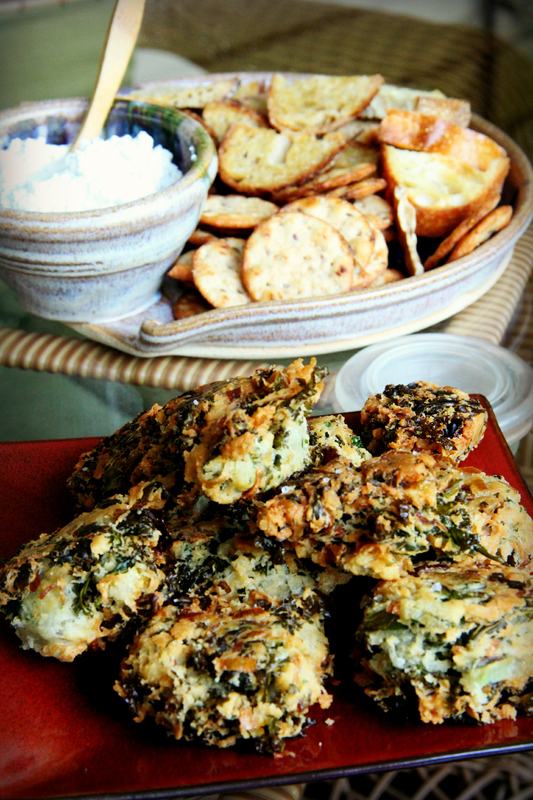 Kale fritters, crostini, and even the occasional frozen appetizer from Trader Joe’s have graced our appetizer dinner table at times. The abundant produce at your local farmer’s market in the summer makes it easy to say, “No cooking tonight!” As we journey into tomato and zucchini overload, think raw—think beat the heat with no cooking! Here is a raw, no-cooking-involved recipe that I sampled at the Western Wake Farmer’s Market recently. It would make a perfect appetizer dinner accompanied with Vietnamese spring rolls! Cut the ends off each zucchini and julienne or use a *spiralizer to make into noodles. Sprinkle salt over the noodles and toss. Place in a bowl lined with paper towels, cover, place in the refrigerator for at least 2 hours or overnight. You want to remove as much water from the zucchini as possible before making the salad. In a large bowl, combine vegetable ingredients. Whisk together ingredients for the dressing and pour onto vegetables. Mix thoroughly to coast all noodles. Serve immediately. * I use the Gefu Spiralizer I bought at Whisk! Lemon Ricotta Spread w/crostini and kale fritters pair nicely with a salad, procuitto/melon platter, or a Caprese salad! A cheese and charcuterie board is a perfect summer time dinner! Do you remember sherbet from your childhood? I do. Lime, pineapple, and orange were always hiding in the back of my Nana’s freezer. My favorite way to enjoy it was with 7-Up. A sherbet float was a special treat during most visits to Nana’s house. A bowl of dry roasted peanuts usually accompanied this foam-laden, fizzy concoction. It was the perfect combination—a little sweet, a little salty. Traditional sherbet contains less milk fat than ice cream because it is made with milk not cream. 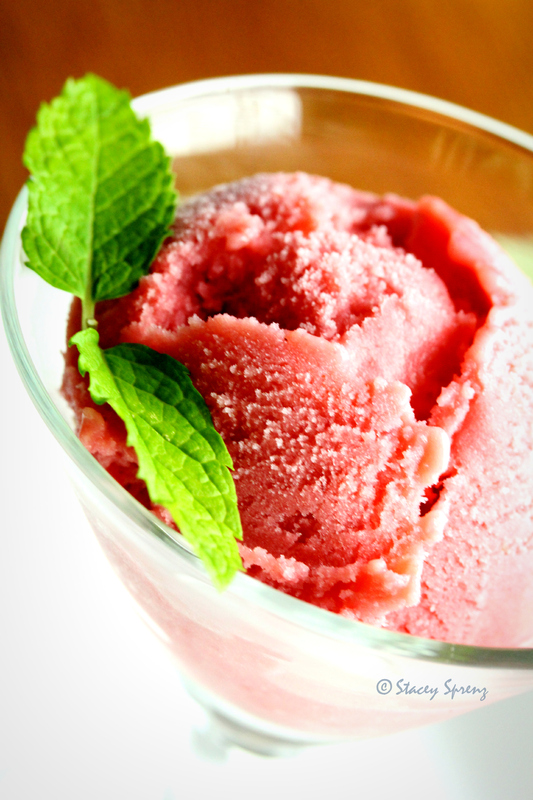 Sherbet it is more like sorbet—lighter, refreshing, and with a higher ice crystal content. It’s a perfect summer dessert because it is fruit based. Likewise, it is an excellent use for that bounty of strawberries that appears in your local farmer’s market starting in late April. Add a little rhubarb, and voila! You now have the delicious frozen equivalent of strawberry rhubarb pie a la mode. In June, try blueberries or blackberries. I have yet to meet a berry that wouldn’t make a great sherbet! This recipe is a bit more decadent than the sherbet I remember from my Nana’s freezer. Admittedly, my refined adult palate doesn’t mind a bit! Buttermilk is the key to creating a sherbet with a creamier texture and fuller flavor. Have fun with this recipe! Be adventurous! 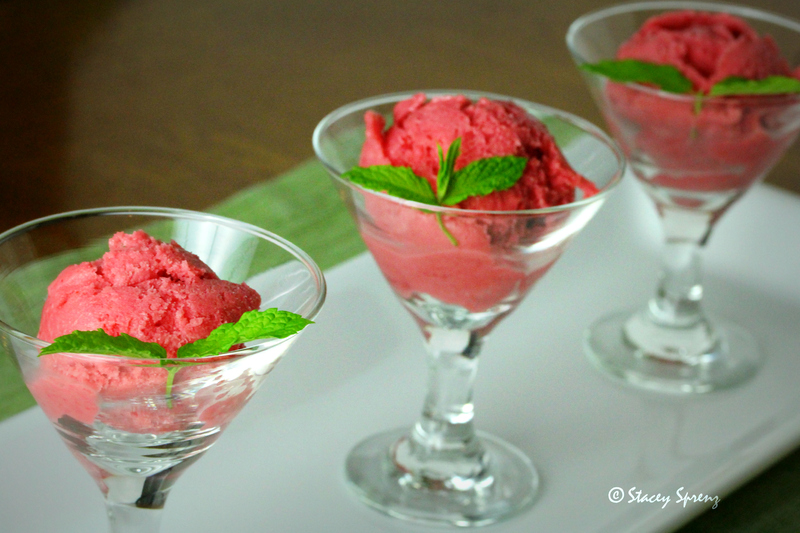 Leave the sorbet in the freezer and grab the sherbet instead! Place the rhubarb, 1/2 cup of the sugar and 2 tbs. water into a saucepan. 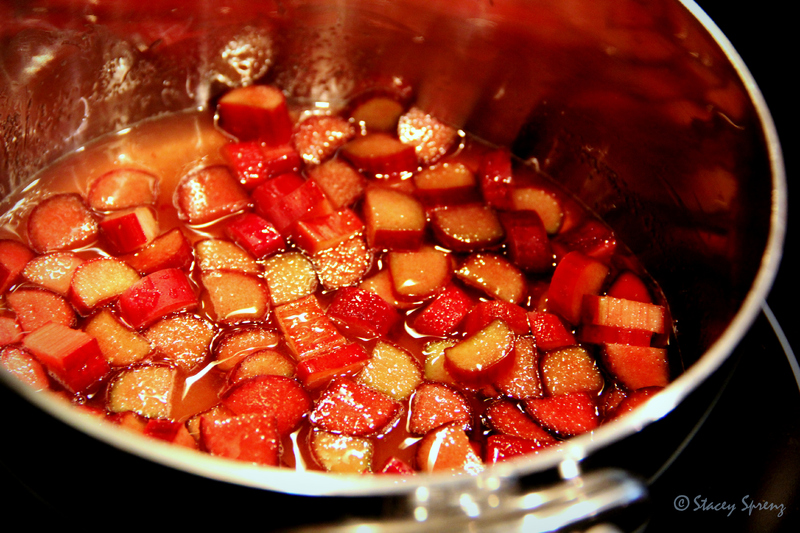 Bring to a boil, reduce heat and simmer for about 12 minutes or until the rhubarb starts to break down. Stir occasionally to prevent sticking. Once rhubarb is cooked, remove from heat and allow to cool. 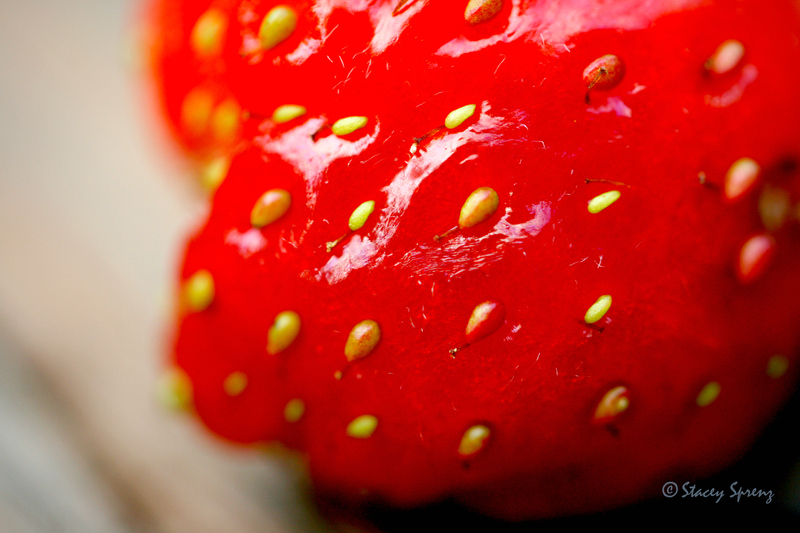 Place the strawberries and the other 1/2 cup of sugar in a blender or food processor. Puree until smooth. Strain mixture to remove seeds. Combine strawberry puree, rhubarb, lemon zest, lemon juice, and vanilla. Whisk until incorporated. Add buttermilk and whisk until thoroughly combined. Place mixture in the refrigerator for at least 6 hours to chill. 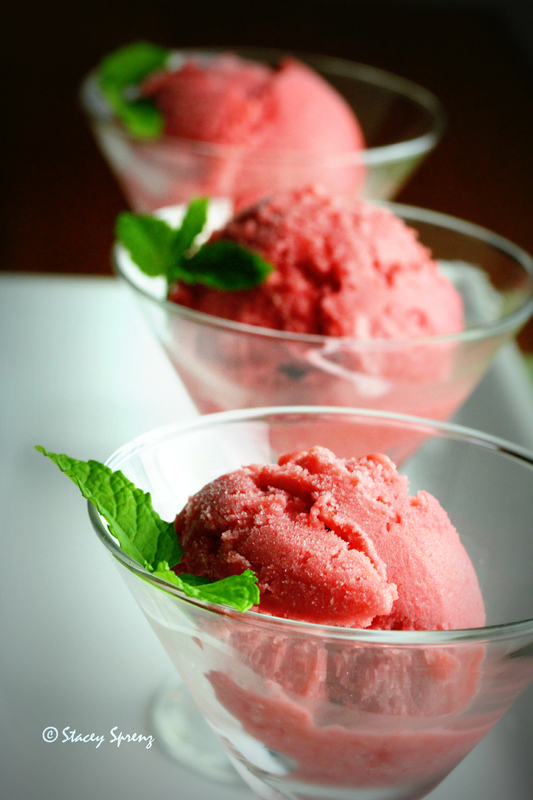 Once chilled, pour mixture into an ice cream machine and process as you would ice cream or sorbet. Place mixture in a plastic, freezer-safe container and place in the freezer. ***Pre-chill your container in the freezer to keep the sherbet from melting!